I'm not talking about my abs here. I'm talking more about what I want them to be, their true potential. It's time to make them a thing I love. So I'm setting a goal. I want my abs to look good enough that I would feel comfortable wearing just my sports bra (and something on bottom, of course) during one of my half marathons this summer. Just to clarify (for my Mom's sake), I'm not saying I will wear just my sports bra. But I want it to be an option. My June 11 half is seven weeks away. With a little focus, I should be able to see a difference by then. And by the Timp Half on July 30, I will have identifiable abs. I am not expecting rockin' abs like EMZ or to be abalicious like Beth and Morgan. 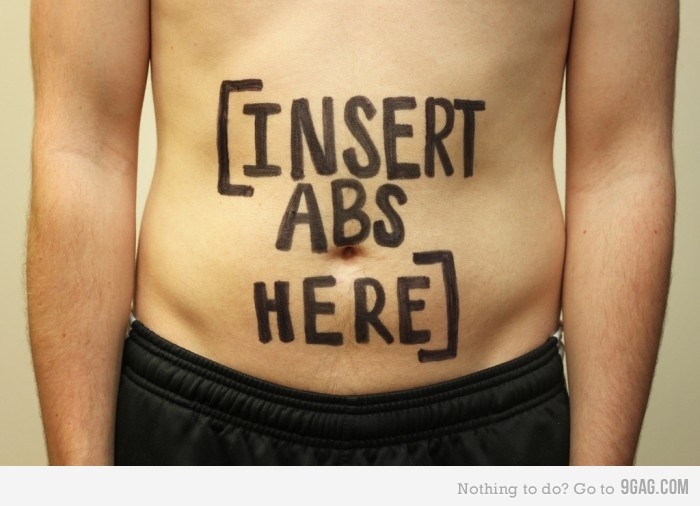 But I do want tighter, more defined abs. So I'm setting a goal and putting it in writing. Tonight's P90X AbRipperX was a good start. Throw in a little more discipline in what I eat, and I'm on the road to success. And if I end up with truly awesome abs (at least as far as I'm concerned), I'll consider before and after pics on the blog. I would give a year's pay to never to do anymore ab work, but I guess it's necessary for runners. Good luck ... crunch away! I want new abs too. I just don't have enough discipline to do anything about it. I want to be abalicious too! You like p90x?! Soooooo want to try it out. Ugh... abs.... my obsession, because after having 2 babies,and my not so lovely genes, my belly will never be the same. 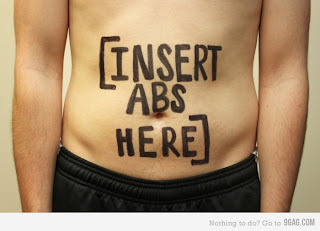 I am certain you will be able to rock the abs. Is your half the utah Valley half? My twinner is running the full. I wish I could be out there to run it with her. I definitely have been trying to work toward abs that I love. You are running UV and Timp??? Me toooo!!! I hope we can meet up! You continue to have a healthy absession. Your small goals are good, too. Keep up the workouts. Then, one day a blogger will be including You in their list of abaliciousness. I would love the same thing but I can't seem to get that baby belly flab off the top!!!! I'm with you on this one C! Although my biggest problem is those fun stretch marks. No matter how hard i work, they don't seem to budge. Good luck on your ab adventure. You can do it! I'd love to have the same goal, but I'm still working on feeling comfortable in form fitting clothing. Someday, I will be sports bra ready.